MI-TRALE developed, signed, mapped and maintains over 520 miles of ATV and ORV trails in the Western U.P. of Michigan. Our trails run throughout Ontonagon, Houghton, Gogebic, Iron & Baraga Counties, the Ottawa National Forest and Copper Country State Forest! We are an all volunteer organization that works very hard to provide safe and well signed trails for your enjoyment! What sort of trip do you like? Waterfalls to see? Viewing gorgeous UP scenery? Exploring historic settlements and mines? Visiting unique little UP towns with their own distinct specialties? Geocaching? Trout streams filled with Brookies, Browns and Rainbows? Bridges to cross?? Our trail system has it all! 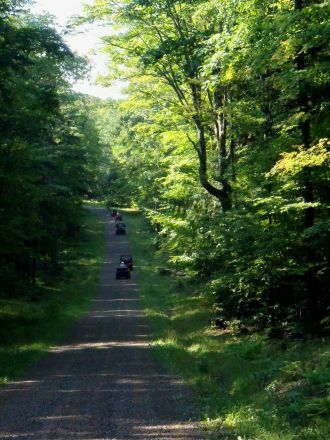 Come ride and explore the MI-TRALE trail system! Copyright © 2019 Mi-TRALE All Rights Reserved. Site originally designed by Burke Design, maintained by Mi-TRALE.